Today there are over a billion hungry people on the planet, more than ever before in history. While the global food crisis dropped out of the news in 2008, it remains a painful reality for the world’s poor and underserved. Why, in a time of record harvests, are a record number of people going hungry? And why are a handful of corporations making record profits? In their new book, Food Rebellions! 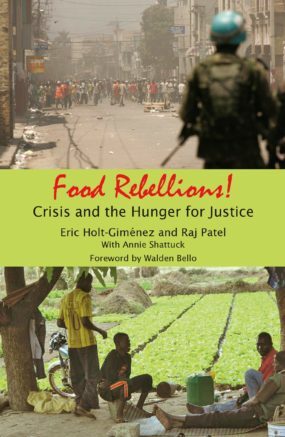 Crisis and the Hunger for Justice, authors Eric Holt-Giménez and Raj Patel with Annie Shattuck offer us the real story behind the global food crisis and document the growing trend of grassroots solutions to hunger spreading around the world. This inspiring book compels readers to confront the crucial questions: Who is hungry, why, and what can we do about it? Food Rebellions! contains up to date information about the current political and economic realities of our food systems. Anchored in political economy and an historical perspective, it is a valuable academic resource for understanding the root causes of hunger, growing inequality, the industrial agri-foods complex, and political unrest. Using a multidisciplinary approach, Holt-Giménez and Patel give a detailed historical analysis of the events that led to the global food crisis and document the grassroots initiatives of social movements working to forge food sovereignty around the world. These social movements and this inspiring book compel readers to confront the crucial question: Who is hungry, why, and what can we do about it? In a time on our planet when official plans to solve the world food crisis call for more subsidies and greater technical fixes, here is finally a manual for creating sustainable resilient food systems. Food Rebellions! is a trail marker on the journey to end hunger and build food sovereignty. Note: The US edition is now out of print. You can order the UK edition from our publishing partner, Fahamu Books. Eric Holt-Giménez is the executive director of Food First/Institute for Food and Development Policy in Oakland. He has also worked as a lecturer in international development and agroecology at the University of California and Boston University. Raj Patel is an award-winning writer, activist and academic. He’s currently a visiting scholar at UC Berkeley’s Center for African Studies, an Honorary Research Fellow at the School of Development Studies at the University of KwaZulu-Natal and a fellow at Food First. Annie Shattuck is a PhD candidate in Geography at the University of California at Berkeley. She was a policy analyst at Food First from 2008 to 2010. Her work has appeared in The Nation, Huffington Post, Foreign Policy in Focus and the academic press. The high and mighty proponents of free trade speak for the interests of multinational corporations when they try to stifle the economic policies that empower peasants, family farmers, and farm workers to grow healthy supplies of food while protecting Mother Earth. Rather than continue down the path that led to today’s economic, environmental, and social catastrophe, Food Rebellions! calls on us to raise our voices in rebellion, join together, and place sustainable production and rural economic opportunity at the base of our recovery efforts. Download the Foreword by Walden Bello.